Now I'm in the final segment of my sabbatical, and in some ways, this last part will be less exciting than the rest. I've been to the Holy Land, Turkey, Malta, Germany (and even a very brief visit to the Netherlands and Belgium!). Now back to the relative "humdrum" of Rome! I'm back at the house at the North American College, with a new group of priests. The program here offers four "modules," and priests can sign up for any or all. Some have been here for all four; some for just one. I signed up for segments 2 and 4. So while most of the guys I know from module 2, there are new faces. In that sense, a new group. Our topic for the next (almost) three weeks is Christian Art and Architecture, and we'll be having some field trips! The first several days, as was the case with each module, is a retreat. Yesterday, of course, was the Solemnity of the Annunciation -- or, as someone pointed out when I was in the Holy Land, and we visited the very place of the Annunciation, it really ought to be the Solemnity of the Incarnation. Here's a view of a beloved, ancient icon of our Lady, under the title, Salus Populi Romani. The claim is made that Saint Luke himself painted it; what is indisputable is that it's been venerated in Rome since before the time of Saint Gregory the Great. Our guide pointed out that right after his election, Pope Benedict came and prayed a while before this icon; and Francis did the same. (The link above will take you to better, closer images.) Also, note the image at the top, in a frame? What you're seeing is the pope, in a group of people, tracing something in snow. I'll come back to that. Here's the most precious relic in the basilica: the remains of the manger in which our Lord was placed after his birth. Is this credible? 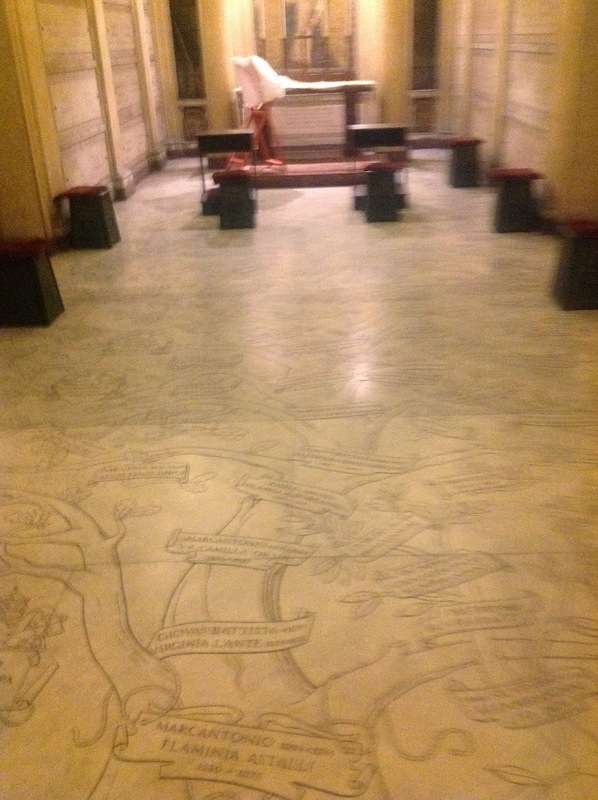 Our guide pointed out that the wood has been tested -- it's old enough -- and Saint Jerome attested to it personally. His bones, by the way, are also buried under the high altar here. Facing the Lord's crib is this lovely image of Pope Blessed Pius IX, who loved to pray here. Look at the joyful gaze on his face! Of the four major basilicae, this one was the last to be begun, but has more of the ancient buildings still in place. For example, at Saint Peter's, the "new" basilica (erected in the 16th century) was build pretty much right on top of the one the Emperor Constantine built; if you go down to the lower levels of the basilica, you can see some signs of that. Something similar happened with Saint John Lateran and Saint Paul; but both of these were badly damaged by fire, so little remains in them of the ancient structures. But for Santa Maria Maggiore, the central structure is original. The columns in the nave, for example, are from the 4th century. 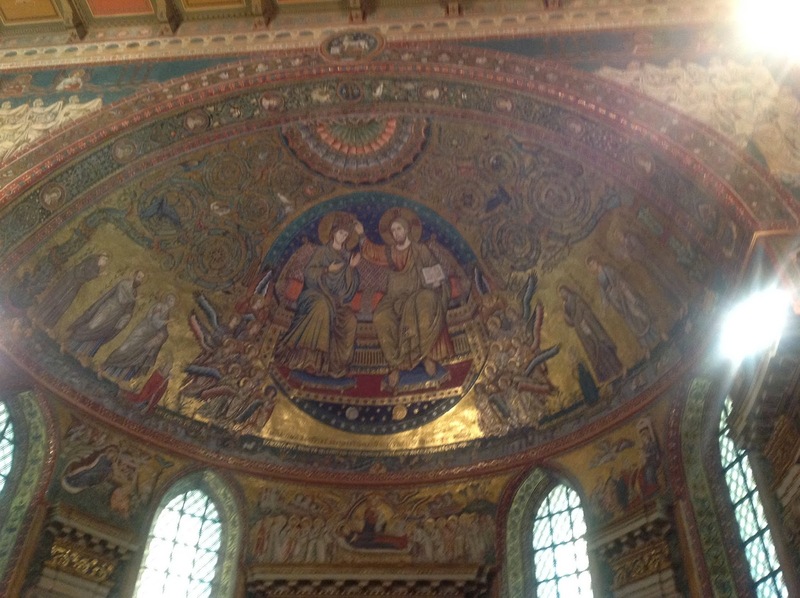 These mosaics are from 5th century; when the church was modified, they were taken down, and put back up. How about this as a tabernacle? 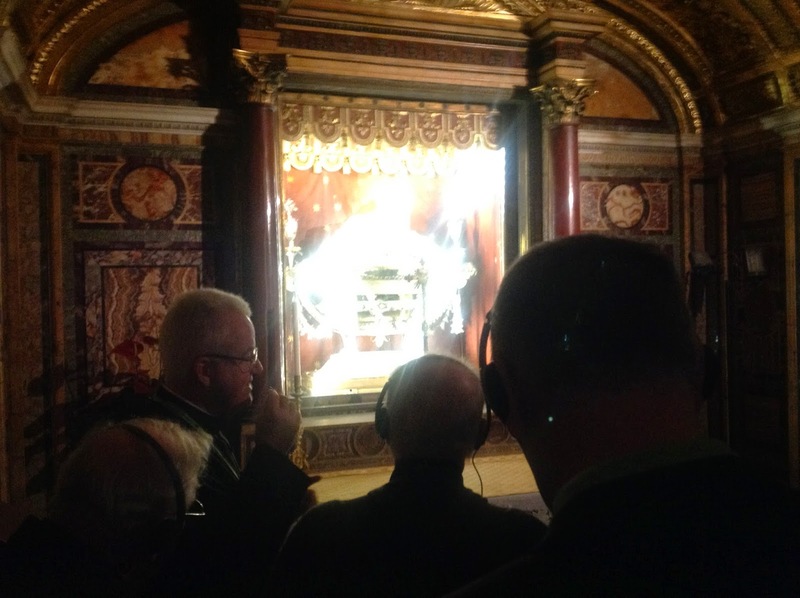 Actually, it's not the tabernacle used, apart from Holy Thursday, but it was at one time. 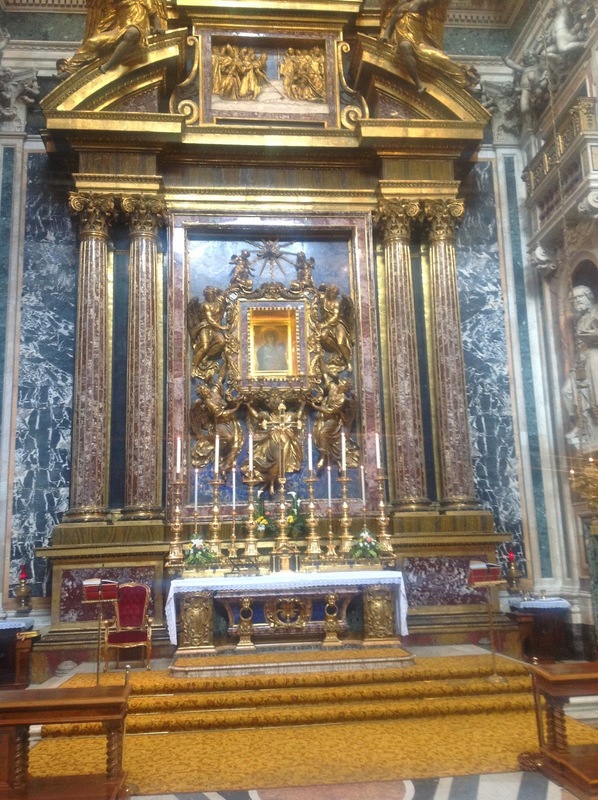 (The chapel opposite it, where the icon of our Lady is enthroned, also houses the tabernacle.) 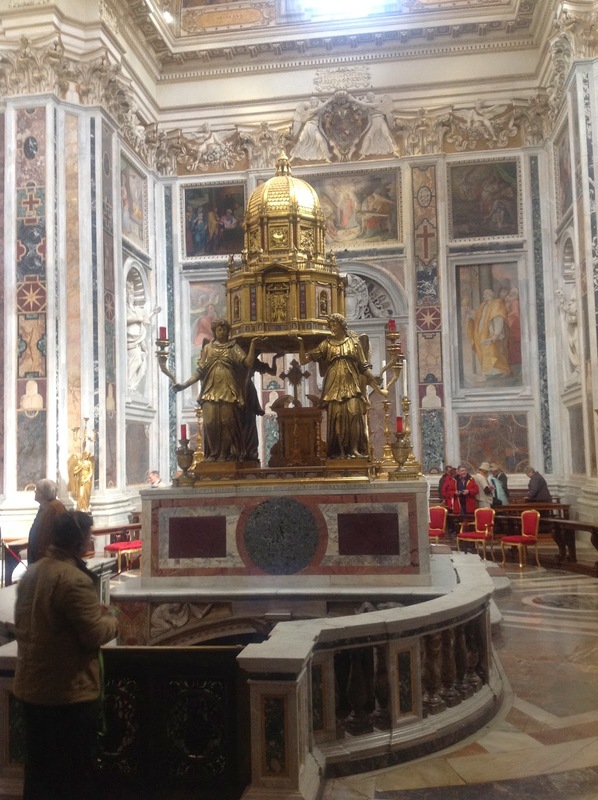 Below this is the altar Saint Ignatius of Loyola used for his first Mass, relocated from somewhere else in the church. One of the fun things about a tour like this is seeing things few ever see. 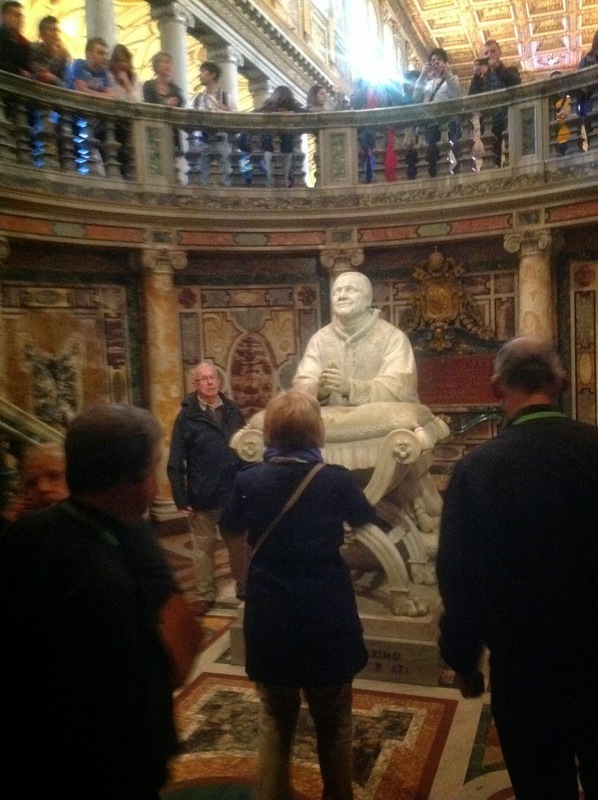 In this case, we were able to visit a crypt below the church that honors the Borghese family, one of the many prominent families of Rome down through the centuries. 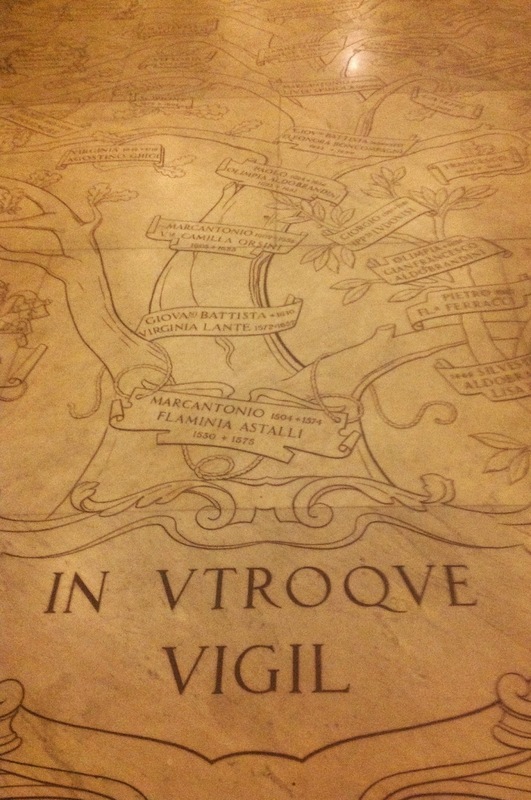 One of the things you see, if you spend some time visiting and learning about Rome, is how the lives and fortunes of certain families of wealth and prominence are intertwined with the life and history of the Church. Many of these families' members would be clerics in the Church, even cardinals and popes. And they would provide much of the vast sums the Church needed, both for its buildings and artwork, but also for its care of the city's needs and the people. Recall that for a long time, the pope was the temporal ruler of central Italy. At the other end, the latest branches of the tree show birth dates in the 20th century, and a couple of dates of death in the 21st. The top of the main trunk of the tree is incomplete, and there is room for it to be continued. Isn't that lovely? May they rest in peace. One whimsical thing about the influence of the Borghese family. The family crest includes an eagle and a dragon. If you prowl around the basilica, and look closely, you will see these images in various places: handles on the closets in the sacristy, and even on kneelers in the chapel where we had Holy Mass. Our guide had lots of stories to tell, and we were running short on time; so our last few stops were in a hurry; so no pictures of some of them. We went up a broad staircase with very deep, very low-rise steps of marble. Do you know why they were built that way, he asked? We did not. "To allow horses to come up!" He pointed out that in a time of no elevators, getting up those steps -- to the apartments -- wouldn't be easy for some older clerics. So they had a horse bring them up! 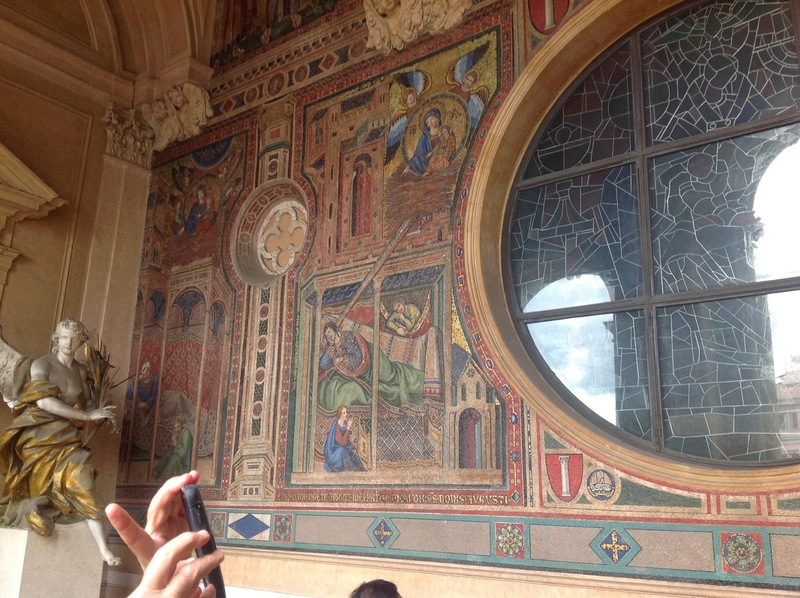 In between, we saw this mosiac on the front of the basilica, on a porch above the main entrance. Unless you come up here, however, you'll never notice this, because the facade was modified in the 18th century. 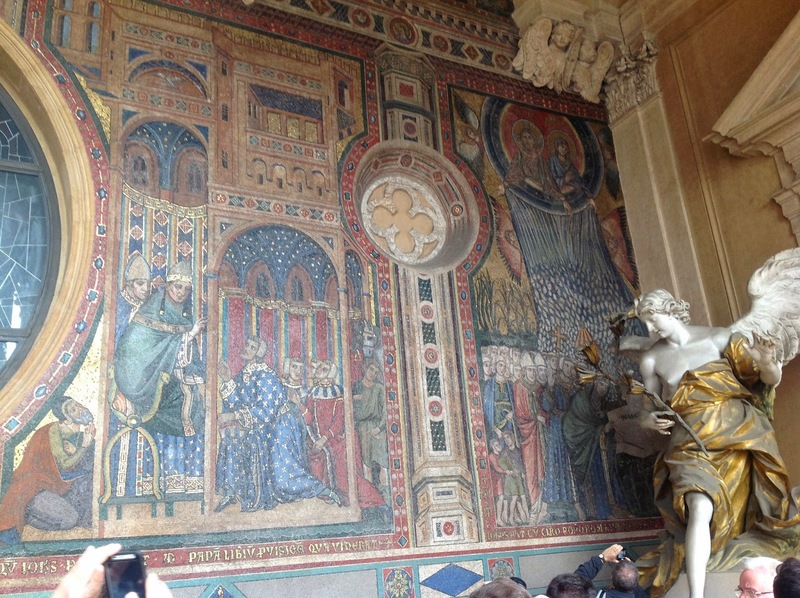 And then this side of the mosaic shows the couple approaching the pope; and then it shows the snowfall to the right. I'm sorry I didn't get a closer shot, but you can just see our Lord, with our Lady at his left, in a circle overhead, causing the snowfall. Our genial guide captioned the picture with a quote from our Lord: "The things my mother makes me do." So remember the detail in the first image, of the pope tracing in the snow? The story goes that when he saw the snow, he immediately traced the plan of the basilica that was built shortly thereafter. As for Belgium...when I said it was a brief visit, I really meant that. Near Aachen is a point where Belgium, Netherlands and Germany meet. I went to that spot. My visit to Belgium took me maybe 300 yards inside the country! Makes me feel almost as if I were there. I use my iPad, it couldn't be easier. And the resolution on them seems pretty good; when I blow them up, they still look fairly clear to me. The flick, In Bruges, made me want to visit Belgium. The beer looked so tasty! I agree, Belgian beer is tasty!